← 356 "The Father, the Son and the Holy Guest Star"
This article is about the episode. For the mission in The Simpsons: Hit & Run, see Level 3 (The Simpsons: Hit & Run). Marge, Lisa, Bart and Maggie go through a metal detector safely, but Homer sets it off. After three attempts (and removing all but his underwear), Homer is then searched with a scanning wand by a security guard. "Does any kid do this anymore?" The Bonfire of the Manatees is the first episode of The Simpsons' seventeenth season. It aired September 11, 2005. "Marge leaves her house after discovering Homer was filming a dirty film there, and she meets a man that spends his life saving manatees." Unable to repay his gambling debts to the Springfield Mafia, Homer is forced to let Fat Tony use the Simpson home as a set for the "gentlemen's film" Lemony Lickit's a Series of Horny Events, starring Carl and Lenny. Homer sends Marge, Bart, Lisa and Maggie to "Santa's Village" to get them out of the way. When Marge and the kids return, they discover what is going on and a disgusted Marge walks out, leaving Homer alone with the kids. Before she can be reconciled with Homer, Marge meets Dr. Caleb Thorn, a good-looking scientist devoted to saving the endangered manatee. Homer and the kids go to stay with their "country cousins" while looking for Marge (their dog is Santa's Little Helper's brother) who turn out to be much more modern and sophisticated than Homer believes. Meanwhile, Caleb helps Marge realise that Homer is the same man she fell in love with - the only problem is that she still expects him to change. Homer tries to win Marge back by saving a herd of manatees from a gang of jet skiers. He manages to talk the gang into leaving but is overheard calling them "Rubes". The gang turns around and starts beating up Homer. Despite his attempts to organise the manatees to attack the gang, they all flee. Luckily, Homer's country cousin shows up with a notarized court order which puts paid to the gang. Impressed, Marge declares she is taking home "the real endangered species: the devoted husband." 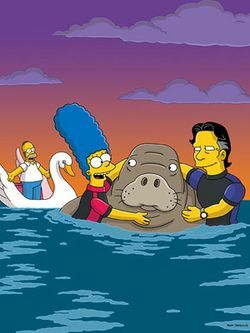 Al Jean originally pitched the idea of an episode based around the Simpsons rescuing manatees in 2003 during the writers' retreat sessions for The Simpsons Movie. Although not used in the movie, the idea eventually became an episode in its own right. It was the first episode to air in September and first non-Halloween episode to start out the season since season 11's "Beyond Blunderdome". The episode was watched by 11.1 million people. On May 11, 2008, Entertainment Weekly named Alec Baldwin's role as Caleb Thorn as the first of 16 great guest stars on The Simpsons. ↑ Dan Snierson. "Homer's Odyssey", Entertainment Weekly,. Retrieved on 2008-08-29. ↑ "16 great 'Simpsons' guest stars", Entertainment Weekly,. Retrieved on 2008-05-11.